I was recently invited to a special sit-in dinner hosted by the cook of one of Philly’s most anticipated food carts: Strada Pasta. Let me start by saying, hats off t0 Strada Pasta’s chef and owner Andrew Gerson for hooking it up for a New-Years Eve pop-up dinner at his Mt. Airy commissary. 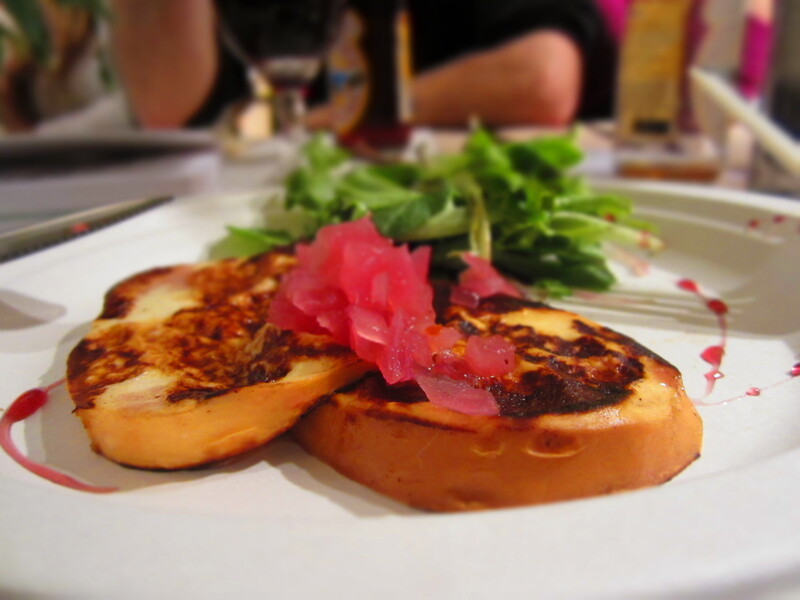 The grilled smoked mozzarella with sweet pickled onions was fantastic and a great way to start the meal. 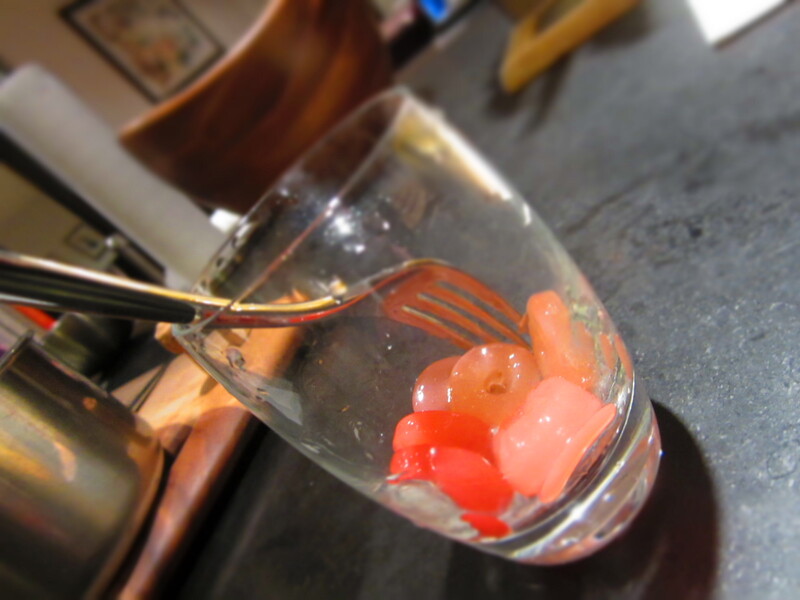 It’s amazing how a simple addition like pickled onions can enhance a dish and this was especially the case here. I wish I had more. The home-made minted gnocci was outstanding and extremely fresh. The mint was tasty yet subtle enough to let the gnocci, which was cooked in brown butter, stand alone. Very delish. 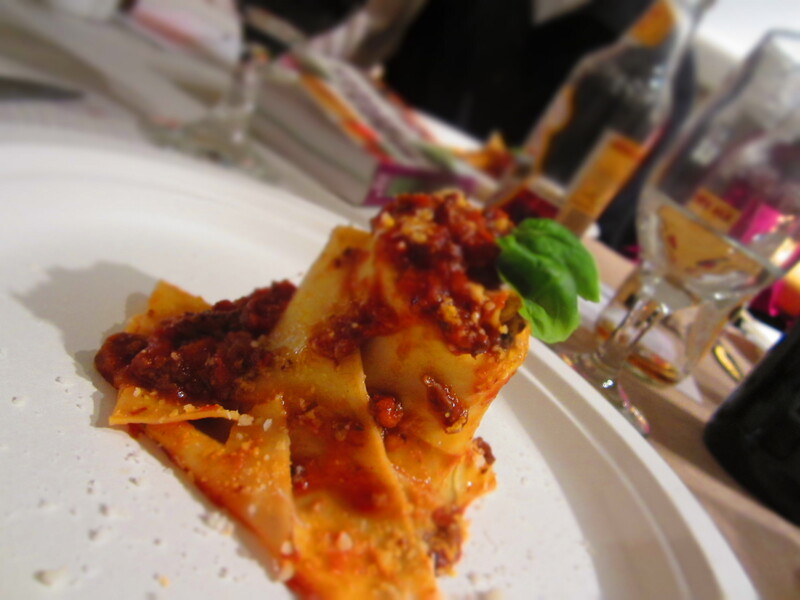 Another home-made banger was the pappardelle noodles with an oxtail ragu. The pasta was nicely cooked and the tomato sauce was super rich and flavorful. 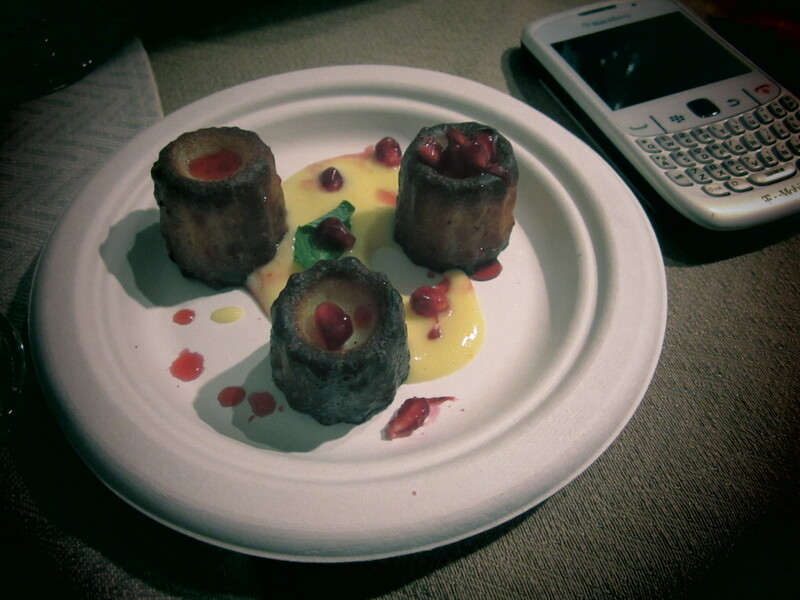 To complete the meal, we were served one of my favorite custard desserts – canele, which sat over a nice orange-champagne sauce and topped with pomegranate seeds. Yum. After this fine meal, I am even more anxious for Strada Pasta to open their food cart. I’m always ready to eat some perfectly cooked pasta with fresh ingredients and bold flavors. We are definitely looking forward to see what else Andrew has up his sleeve. While we wait for their cart to open, we highly recommend that you check the pop-up dinners by Strada Pasta by contacting them at stradapasta@gmail.com. 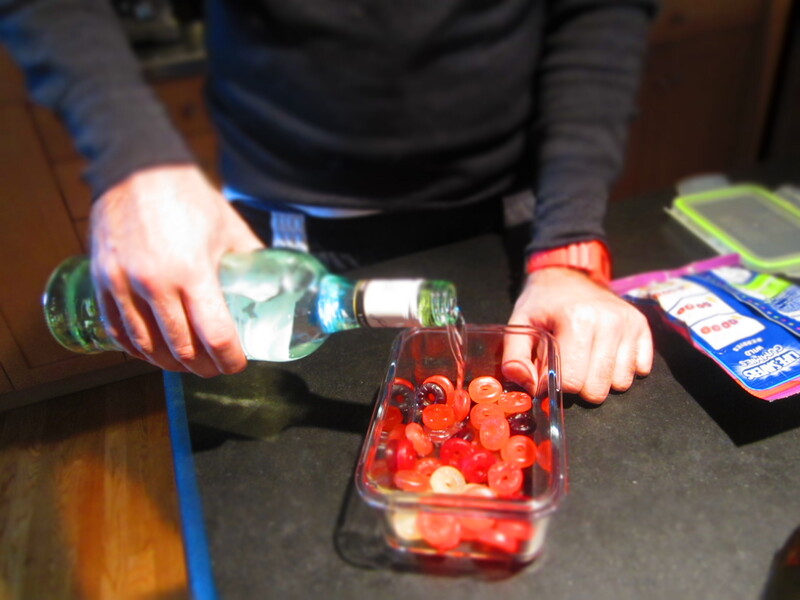 Two weeks ago we posted about an amazing idea – the Drunken Gummy Bear. We said we would try the recipe and we damn sure did. Apparently, when we decided to get these bears it happened to be National Gummy Bear Day, because we couldn’t find any!! 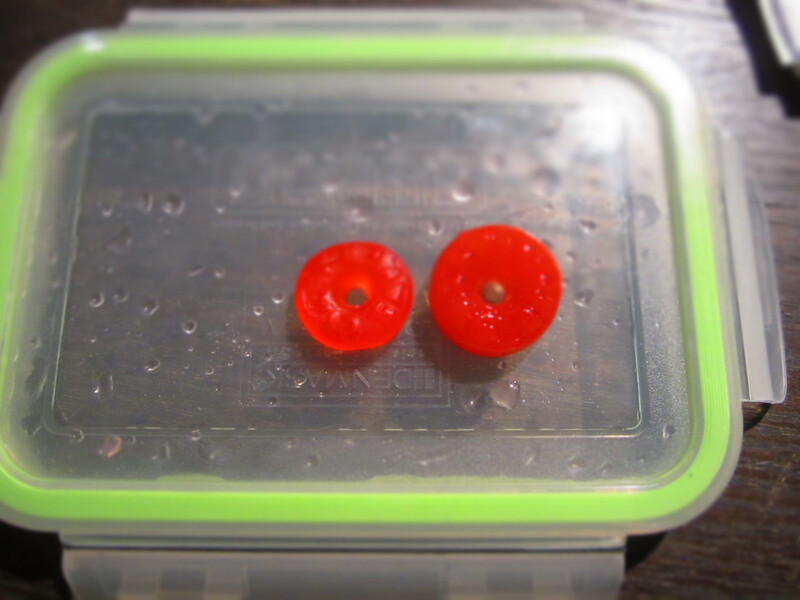 So, we went with the next best thing: Gummy Lifesavers. The recipe is simple. 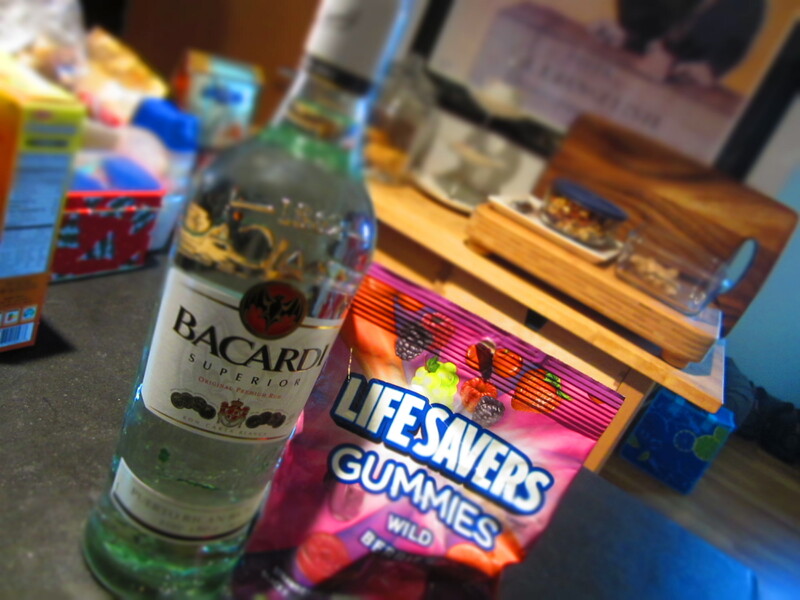 All thats needed is gummies (preferably bears) and a liquor of choice. Refridgerate them for five days, occasionally stirring, and BOOM!!! Ya done. And…um…yes…they grow in size because they really soak the booze up. Please eat your candy responsibly and designate a non-alcoholic candy eater if you are going to be driving. So before I post this island goodness, you might as well play this while reading. It’ll just add to the essence of the meal. BigBite loves to eat and compete…but we can also get down in the kitchen. 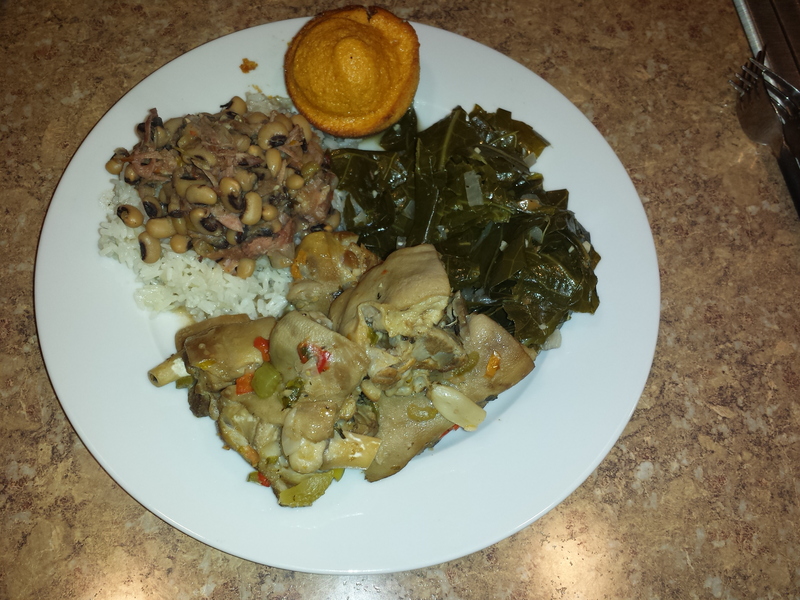 Here’s a recap of one of our latest homemade dinners which we call Mofongo Night. Mofongo, the signature dish of Puerto Rico, is a unique mash-up of fried plantains, garlic, olive oil and pork rinds. You can eat it as is, but can enhance your experience by adding meat, seafood or vegetables, usually in a broth. Traditionally it is served in a pilón, or mortar and pestle. Since we had a few guests, we skipped the pilón and just made mofongo “balls”. 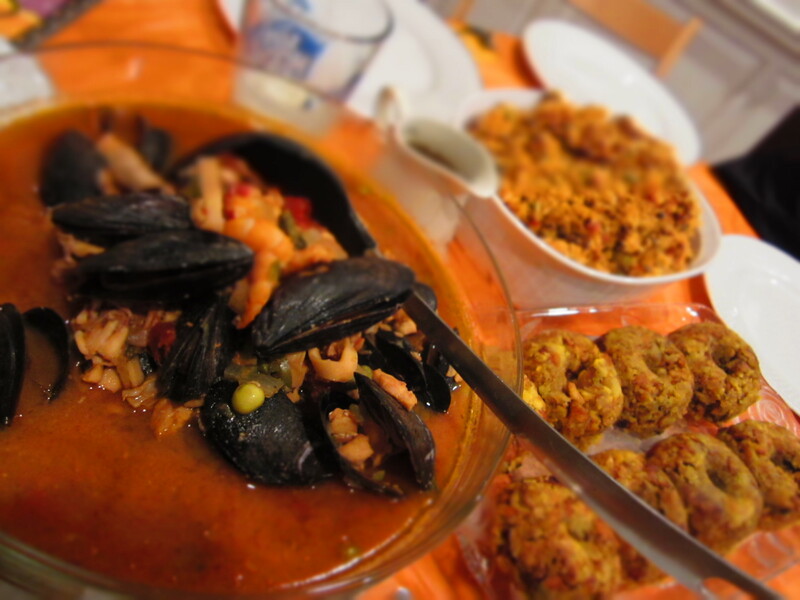 To accompany the mofongo we made a seafood stew, consisting of squid, shrimp, mussels, baby squid, tilapia, scallops, veggies, and Spanish seasonings and ingredients in a tomato-wine-stock broth. 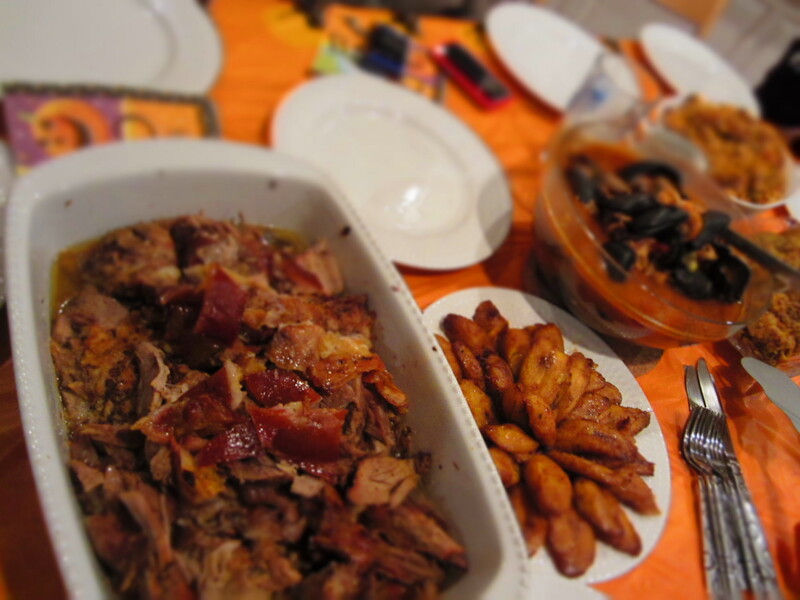 We also made pernil (slow roasted pork). Pernil is also a signature dish in Puerto Rico. 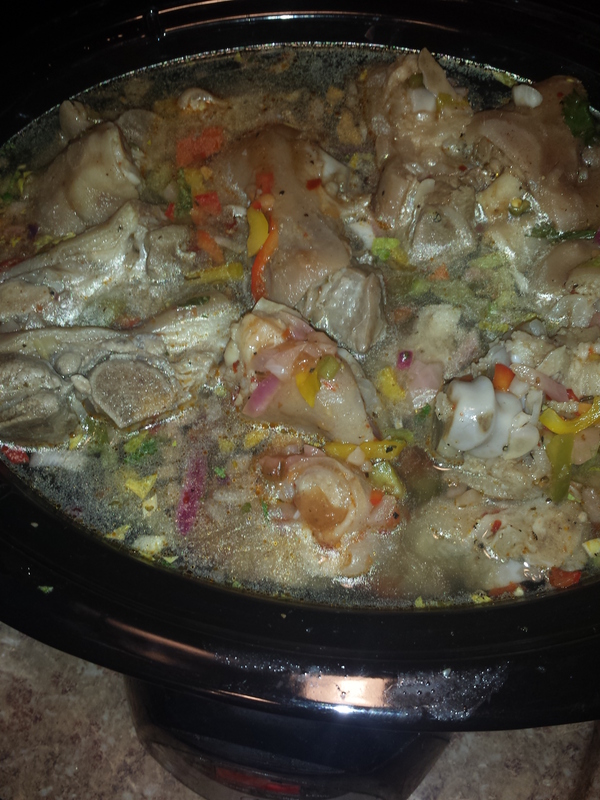 It’s made for special events, holidays, birthdays…Wednesdays…Ok, its pretty common to the Rican diet. We love pork! It’s slow roasted in Spanish seasonings, until the skin is nice and crispy! As always in a Puerto Rican meal, there was rice & beans and sweet plantains to add to your plate. The BigBite gang headed to Pub & Kitchen, this cozy, rustic gem in search of what some say is the best buger in Philly. If there is something we know, it’s burgers. Here’s what we thought. While we waited for this highly anticipated burg, of course we had to try the wings in the meantime. I mean we are the WING KINGS. We tried the honey whiskey wings which scream awesome with a name like that! They were fried very nicely…but honestly they didnt blow anyones mind. They were pretty mediocre. It’s possible that they needed more sauce or more seasoning? Not sure, but those little biddies were not great. We’ve had better wings at Wing King. Let me tell you…this jawn right here, this jawn right here!! Yea, we were pleased with the Parliment burger at P&K. 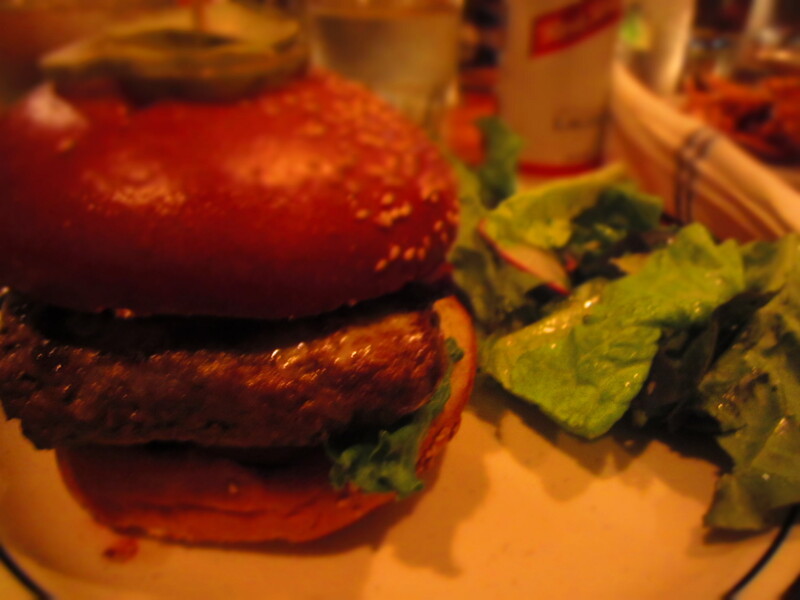 The burger itself was tender, juicy and cooked perfectly. And of course, everything is better when you add bacon, so that addition was wonderful. A nice cheddar and ‘pub sauce’ completed this great burger. After some disccussion, we all agreed that although the parliment burger was awesome, it was still not BigbBite’s #1 best burger in the city. We won’t disclose just yet where our fav burger lives, but we do want to shout out the parliment burger! well done P&K, well done. With the 3rd Annual Philly Bowl planning on the horizon, I had a craving for some CHILL LEE! 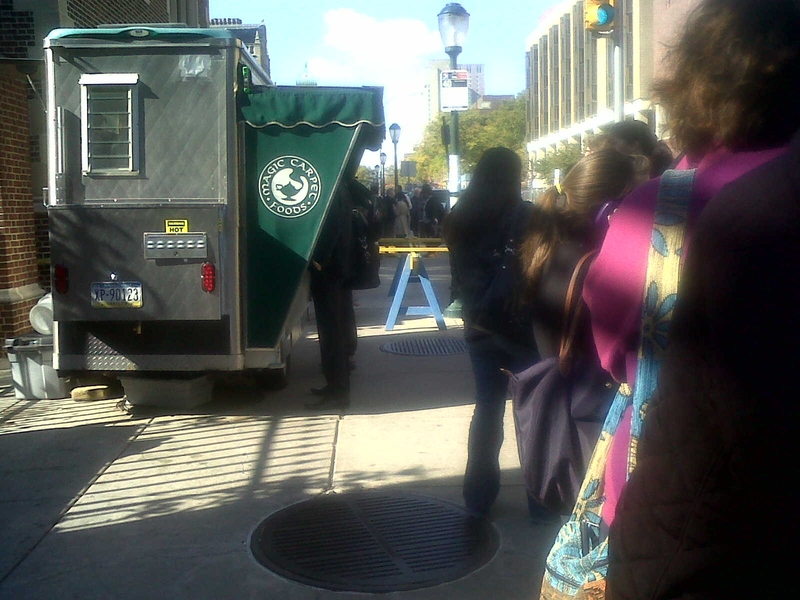 I made my way up to one of the best vegetarian and vegan food carts in University City…good ol’ Magic Carpet. If you know about Magic Carpet, then you know what you’re talking about. They do vegetarian chili right. In fact, they do everything right. I hit up one of their two locations and got my grub on. 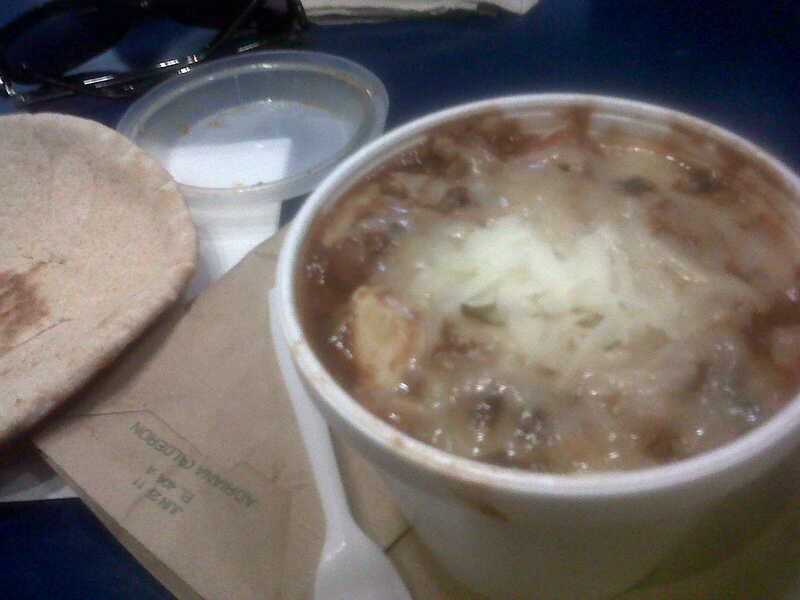 Usually I go for the Bella Donna (tofu meatballs in sauce), but I couldn’t resist getting their veggie chili; a hearty and pseudo-spicy delight, that carries a nice hint of cinnamon and is partnered with pita bread! This chili definitely can stand tall and proud in our Philly Chili Bowl. Best way to order: First, rice with veggies, then cheese, add the chili, then some more cheese. Then drop some hot sauce on that jawn. Bing, bang, boom…you’re done! Maybe dig in your pocket for some change and get yourself a micro-brewed soda to add to the festivity in your mouth. Note, sometimes you have to wait a while before receiving lifes’ treasures. Be warned. You will wait. Behind students, hospital staff, office persons, construction dudes, and maybe a West Philly crazy, but it makes the wait more worth wild. And the people who run the cart are just too nice not to support. So just wait your turn for this treasure on wheels.